Note: On March 10, 2017, the Iowa Supreme Court vacated this decision, and affirmed the district court's order. In a most interesting case from the Iowa Court of Appeals today, the letter of the law prevailed, and the court ruled that a single, 38-year-old grazing horse was all that was needed to create a “farm tenancy” on a six-acre parcel. Thus, the court found that landlords were required to send statutory termination notice by September 1 to properly terminate a lease for a residential acreage (less than 40 acres) where the only "agricultural activity" was one grazing horse. The parties in the case had been warring for a while, apparently over an alleged oral contract for the sale of the acreage to the tenants. After that dispute was resolved in the landlords’ favor, the landlords sent the tenants—who had resided on the property for around 24 years—a 30-day notice of termination. When the tenants did not leave, the landlords sent a three-day notice to quit and then sought to evict the tenants. In their answer to the forcible entry and detainer action, the tenants alleged that theirs was a “farm tenancy” because they grazed a horse on the property. As such, they argued that the statutory notice procedures applicable to farm tenancies[i] required the landlords to send the tenants statutory termination notice by September 1 or their lease would auto-renew for another year. The district court did not agree and entered judgment in the landlords’ favor. On appeal, the Iowa Court of Appeals reversed. And contrary to expectations it does seem. Except for a farm tenant who is a mere cropper or a person who holds a farm tenancy with an acreage of less than forty acres where an animal feeding operation is the primary use of the acreage, a farm tenancy shall continue beyond the agreed term for the following crop year and otherwise upon the same terms and conditions as the original lease unless written notice for termination is served upon either party or a successor of the party in the manner provided in section 562.7. "Farm tenancy" is defined as "a leasehold interest in land held by a person who produces crops or provides for the care and feeding of livestock on the land, including by grazing or supplying feed to the livestock." Iowa Code § 562.1A(1). Until 2013, this case would not have been in question. Several interim changes (most certainly not intended to sweep in this fact pattern) led to this “letter of the law” result. As the court pointed out, in 2006, the legislature changed the law to extend the statutory notice provisions to tenants with a “farm tenancy.” Before the change, the farm tenant was required to “cultivate” land to be entitled to statutory termination notice. As of 2006, the definition of “farm tenancy” included “the care and feeding of livestock on the land.” After that change, however, the tenants' single horse would not have triggered the statutory notice requirement because the statute included a 40-acre exception. The statutory notice procedures did not apply to farm tenancies that were less than 40 acres. So because the acreage at issue in this case was less than 40 acres, the landlords could still have terminated the tenants without mailing notice before September 1. In 2013, however, the legislature changed the law to require statutory notice for all farm tenancies, except for “an acreage of less than 40 acres where an animal feeding operation is the primary use of the acreage.” This new provision was undoubtedly intended to extend the notice provisions to tenants with less than 40 acres of cultivated land. And, the animal feeding operation exception would seem to apply to the tenants in this case. But not so fast. 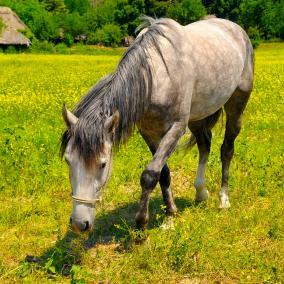 The court ruled that although the tenants grazed a horse, “an animal feeding operation” was not “the primary use of the acreage.” As such, the court held that the exception did not apply. Because the tenants’ primary use of the property was not agricultural, these tenants were entitled to the protections afforded agricultural tenants. I see the court’s point, but whoa, Nellie. This can’t be what the Legislature intended. The takeaway? Landlords, take heed. You may have new categories of tenants arguing that they are entitled to statutory notice provisions. Backyard chickens? A pet emu? Both fall within the definition of "livestock" under Iowa Code § 562.1A. Notice by September 1? We’ll keep you posted. The case is Porter v. Harden, No. 15-0683 (May 11, 2016). [i] Iowa Code §§ 562.6, 562.7.